I know everyone has their own favorite project management tool to keep them organized and stay on top of tasks. However, I do believe that although some project management tools work very well for others but it may not be as good and effective for you and your business. I’ve tried quite a few like Asana, Trello, and Freedcamp but I always find something lacking that always makes me go back to Teamwork Projects. Why I Love Teamwork Projects? There are several reasons why I love this app. First, is it’s design and layout. Over Asana, I love the clean layout that Teamwork has. It’s not cluttered, easy to navigate and comprehend. When you’re working with several people on several projects, it’s very easy for communication to get lost. However, with Teamwork, you can easily add comments on Tasks, Subtasks, Files, Notebooks, etc. What I also love about it is having the ability to respond to the email notifications that are sent on your inbox and you are assured that your response will fall exactly to which task, subtask, file, or notebook that it was left. I know this is not new, you can also do this with Asana, but I love how much whitespace you have that makes things more visible and less confusing. I’ve been on Teamwork for a while now and I love how they listen to their community. Kanban view (like Trello) was recently ruled out inside Teamwork Projects, if you’re a fan of Trello but doesn’t quite like the limitation there is on their platform, then you should consider checking out the new option inside TW that allows you to have tasks in column view. Another recent update was the ability to add several levels of subtasks. Yes! I haven’t tried up what depth of subtask you can add but I have tested and was able to add until 5 levels below, that’s a game changer as well. Have the ability to customize visibility of projects. You can add unlimited people inside projects and add people the company. This comes in handy for agencies working with different clients businesses and possibly with other third party partners. You can also set different roles and different access to different accounts. Another common feature are task lists, tasks, deep-level subtasks and dependencies. You will also have the ability to add recurring tasks and set them on your desired deadlines. Like I mentioned earlier, communication is key. Anywhere in the app, allows a user to leave a comment, to ensure that communication falls on the right spot. However, although this can be really helpful and handy, some comments will fall in between the cracks but there’s also a solution to this. There’s a neat Everything tab. Yes, you will be able to view everything inside your app and you have the complete filter options. A feature that I love so much inside Teamwork is the ability to have a template task list. This is very helpful if you have specific tasks for different specific tasks. HINT: Really helpful when you’re trying to streamline your business processes. Milestones are really important for some projects. You can add milestones inside projects and connect them to existing tasks lists and tasks. Get a view of how much you have accomplished before reaching your milestones. This was a deal breaker for me for the project management tools, having the ability to add notebooks within projects. I love how you’re able to add specific notes on specific projects such as client project brief, login credentials (yes, some prefer sending things over than using Lastpass), and other client-specific notes. Want to Use Free Forever Plan with Teamwork Projects? 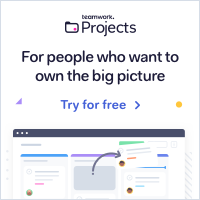 Okay, I have shared on the video that I’ve been using Teamwork’s free option for quite a while now and not until recently that I have upgraded to having more projects. Of course, this is not a perfect way to use it but this really helped me to get more familiar with the tool before deciding that it’s really fitting for my needs. Learning curve and getting used to the tools you’re using is also crucial. However, you do get a FREE 30-Day Trial when you sign up for Teamwork Projects. I only used one project for all my clients. Each client will have their own Task List. Under each Task List, I have outlined the tasks that I need to done for those projects. You can also make use of Tags to identify different statuses of each tasks. This is great if you are not giving access to clients inside your project management tool. Since I love everything about the Notebooks tab, I have organized the Notebooks according to clients. Internally, I’m giving initials to clients which makes it easier for me to keep track everything that are client-related. I have created Categories basing on each clients and filing the notebooks under their specific category with the applicable naming convention. If I need to look for a notebook, I can simply click on the Categories section and easily find what I need. This is applicable if you’re not giving access to your clients. Although that is possible but I don’t recommend it unless it’s only you and your team working on things. There are also other features that bigger agencies are using such as the Reporting and GANTT charts but these are still nuances to the level of business that I have so I can’t give you further information on that one yet. What’s your favorite project management tool and what’s the biggest factor that sold you to using it for your business success? I’d love to know more about it in the comments below. Copyright © 2013 Your Virtual Help | Nyle Rigor. All Rights Reserved.